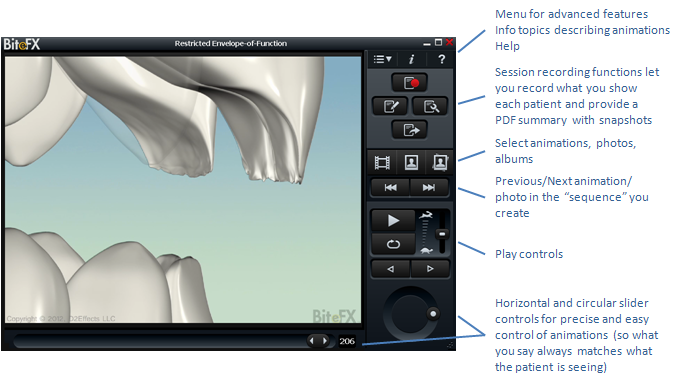 BiteFX helps you communicate the key concepts of occlusion to your clients. Because your clients can see how their bite ought to work they are better able to accept your treatment recommendations. Explaining occlusion need no longer be a challenge - BiteFX gives you the visual explanations that make things obvious. If you have an earlier release of BiteFX, you should read Upgrade to BiteFX V2.0w for Windows. Saves time as, with BiteFX, explaining occlusion-related treatment plans takes much less time. How jaw position can change between taking an impression and fitting a crown on a rear molar, and hence why it is important to establish a stable jaw position before taking impressions. 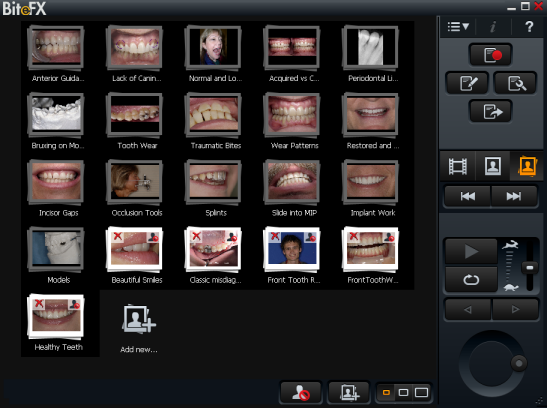 A collection of occlusion-related photographs are provided which can be integrated with your presentations and selected easily at any time by clicking on the Picture button . The BiteFX interface is designed for easy, intuitive use. Animations, pictures and albums are selected from panel displays. Animations are played using standard video-player-style controls or by dragging sliders. Recordings are made using the record on/off button, explanatory notes edited, and the resulting report emailed, printed or saved for your patient. Welcome and Help Instructions: When you first invoke BiteFX, and any time you press F1, you see a pane that gives basic instructions on using the product. Info Pane: The Info button is always available to bring up a list of points that describe the current animation. A useful introduction to each animation or reminder of points to communicate. User Guide: Detailed description of all parts of the product and how to use it. 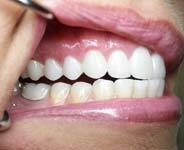 scheduled for a full mouth of much needed cosmetic dentistry. 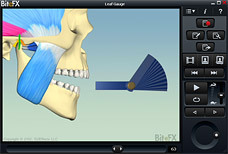 BiteFX is such a great tool to use to explain the fundamentals of occlusion for patients and QuickStart got us off to a great start.